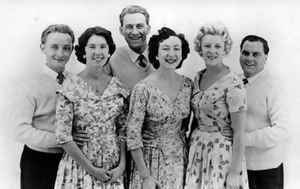 Backing vocal group lead by British arranger Mike Sammes (19 February 1928 – 19 May 2001) with as core group: Valerie Bain, Marion Gay, Enid Hurd, Mike Sammes, Ross Gilmour, Mel Todd and Mike Redway. Provided backing vocals for many artists including Olivia Newton John, The Beatles, Supercar, Stingray, The Secret service, Russ Conway etc. Associated with inter alia Disneyland Records. The Mike Sammes Singers remained very busy into the 1970s, doing recordings for television (The Secret Service) and appearing on the small screen (the Val Doonican Show, 1971). By the mid-1970s, though, the demand for backing vocals had faded considerably, due to the introduction of multi-tracking and synthesizers. On "The Last of the Summer Wine", the Mike Sammes Singers contributed the "Summer Wine" song over the opening credits of the Christmas 1983 episode "Getting Sam Home". Sammes died at the age of 73 in May 2001 and the Mike Sammes Singers died with him. Julian Orchard, Peter Felgate, George Romaine, Barbara Brown (3), Barbara Elsy, Marion Madden, The Mike Sammes Singers*, New World Show Orchestra* , Conducted By Johnny Douglas Julian Orchard, Peter Felgate, George Romaine, Barbara Brown (3), Barbara Elsy, Marion Madden, The Mike Sammes Singers*, New World Show Orchestra* , Conducted By Johnny Douglas - Oklahoma!